Mort is currently 79 years old and still painting. In fact, he has wider recognition and fame now than he did when he worked for the men’s adventure mags. But he no longer does magazine illustrations. He is best known today as a painter of American history scenes, particularly Civil War art, which has been his primary specialty since the 1980s. Indeed, if you Google his name, most of the sites that show up in the search results — including his own main website, MortKunstler.com — focus largely on his Civil War art. If you search Mort Kunstler's name on Amazon.com, you’ll see a whole series of books that feature his Civil War paintings (as well as prints, calendars and other items). To date, no books have been published that focus on Kunstler’s illustration art for men’s adventure magazines, despite the fact that Kunstler painted literally thousands of cover paintings interior illos for men’s adventure mags, both under his own name and the pseudonym Emmett Kaye. But there are several websites and web pages you can visit to see a good cross section of examples. One is the Mort Kunstler page on the American Art Archives website. As I mentioned, Mort Kunstler’s own primary website focuses on his Civil War paintings. But it also a lot of in-depth biographical information about him and the “American Popular Culture” section does showcase examples of the original paintings he did for magazines, books, movie posters and ads. Recently, I noticed that there is now a second official Kunstler website — KunstlerIllustrations.com — that primarily focuses on his magazine art. 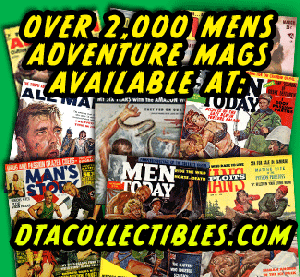 It shows and sells prints of some of the ultra-cool original paintings Kunstler did for men’s adventure magazines. They’re in the sections of the site labeled Crime, Dames, Exotica, History and Man vs. Wild. The KunstlerIllustrations.com site is maintained by the staff at the Kunstler Enterprises studio. They’ve also created a companion Kunstler Illustrations Facebook page where you can find additional Kunstler artwork and historical info that’s not on KunstlerIllustrations.com. If you’re a Facebook member, you should definitely visit that page regularly. I’ve posted quite a few Mort Kunstler covers and illos on this blog. In case you missed them, below are links to a few of my past posts that featured his work. Most recently, I did a post about the beautiful interior illustrations Kunstler created for a condensed version of the book “His Majesty O’Keefe,” published in the April 1954 issue of Sport Life magazine. Several of my past posts have featured World War II scenes painted by Kunstler. One is on the cover of the May 1963 issue of Stag. It’s an awesome aerial view of the sinking of the USS Indianapolis, the ill-fated ship mentioned in the movie Jaws. Kunstler’s cover painting goes with a story inside about the Indianapolis — “108-HOUR MID-OCEAN ORDEAL...500 DEAD...300 STILL AFLOAT” — written by the legendary men’s adventure magazine writer Walter Kaylin. Another previous post features Kunstler’s cover painting for the January 1961 issue of Male, which goes with a wild WWII story about some Nazi-hunting “Virgins from Hell.” In that same issue, there’s a luscious blue-and-black Kunstler duotone illustrating another WWII story, a yarn a Yank soldier who meets up with “a never-say-no British nymph and a beautiful Manila pom-pom girl” in the Japanese-occupied Philippines. That post also shows an example of a Kunstler painting that was used on the covers of two different men’s adventure magazine covers — but with a twist. The scene depicted shows a horde of vicious Mandrill baboons attacking two people. In the first version, used for the cover of the May 1955 issue of Men, a manly white hero is desperately trying to fight off the baboons, using his empty rifle as a club. On the ground at his feet is an African native who has already been overcome by the bloodthirsty critters. As I found out from collector Rich Oberg, who now owns the original painting, Kunstler changed the bottom right corner years later for use on the cover of the April 1971 issue of Male magazine. In the revised version, Kunstler painted over the African native and replaced him with a blonde damsel in distress. Like the legendary illustration artist Gil Cohen, who I recently interviewed, Mort Kunstler did most of his magazine art for the men’s adventure mags published by Martin Goodman’s company Magazine Management (or it’s subsidiaries), such as Action for Men, For Men Only, Ken for Men, Male, Men, Sport Life and Stag. 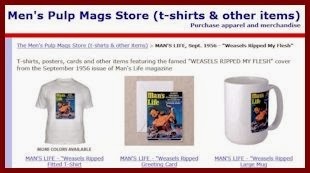 However, like Cohen, Kunstler did work for some other men’s adventure mag publishers. 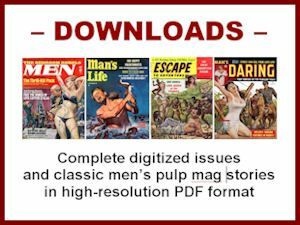 Lately, I’ve been collecting copies of Adventure magazine from the 1950s, the decade when it changed from being a classic all-fiction pulp magazine to a men’s adventure format. 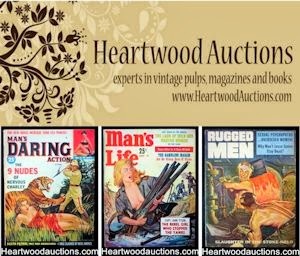 In those years, Adventure was published by pulp pioneer Henry Steeger’s company Popular Publications, Inc. and it’s subsidiary New Publications, Inc. Many of those Adventure covers from the Fifties have excellent cover paintings by Mort Kunstler, under his own name and as Emmett Kaye. Below are scans of some of my favorites. I’ll post some more in upcoming posts. 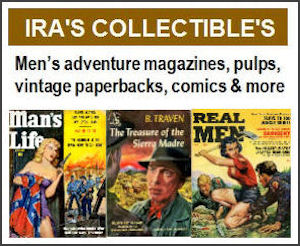 By the way, although there are no books focusing on Kunstler’s men’s adventure magazine art, there are many nice examples of it in the two best books about the genre: It's a Man's World: Men's Adventure Magazines, The Postwar Pulps and Men's Adventure Magazines in Postwar America, featuring the Rich Oberg Collection.